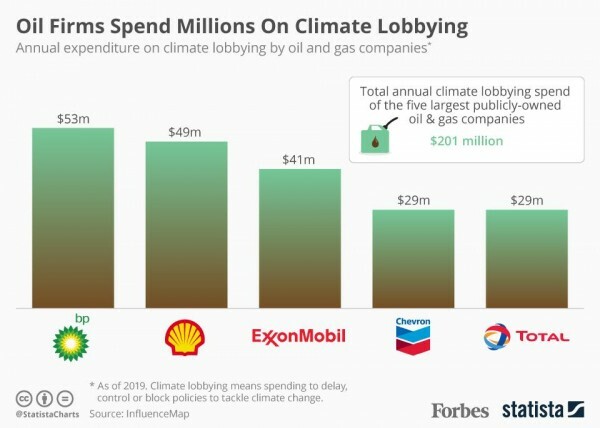 Every year, the world's five largest publicly owned oil and gas companies spend approximately $200 million on lobbying designed to control, delay or block binding climate-motivated policy. This has caused problems for governments seeking to implement policies in the wake of the Paris Agreement which are vital in meeting climate change targets. Companies are generally reluctant to disclose such lobbying expenditure and late last week, a report from InfluenceMap used a methodology focusing on the best available records along with intensive research of corporate messaging to gauge their level of influence on initiatives to halt climate change. The research also found that the five companies listed support their lobbying expenditures with a financial outlay of $195 million annually for focused branding activities which suggest they support action against climate change. The most common tactics employed are drawing attention to low carbon, positioning the company as a climate expert and acknowledging climate concern while ignoring solutions. The report said that the campaigns are misleading the public given that the companies listed continue to expand their oil and gas extraction activities with only 3% of spending directed to low carbon projects. Both Shell and Chevron rejected the report's findings and reinforced their commitment to reducing greenhouse gases and addressing climate change.